After a reconnaissance long weekend trip with the Tbilisi ex-pats it was time to head out on my own and fly the big mountains. Needless to say I was a little intimidated. Tim asking about emergency procedures, reading about Dave Turner‘s LM5 falling out of the sky, and being warned of venturing into Ossetia or Russia, which both happen to be downwind of the “very strong winds” at this time of year. 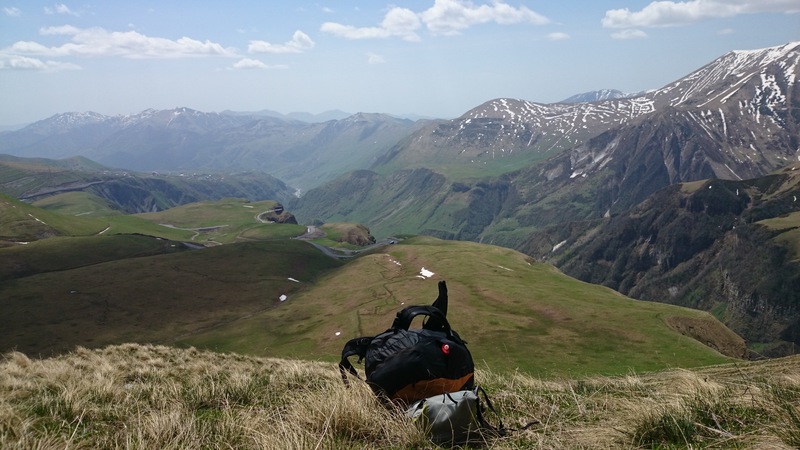 I was tired after an early start and then waiting around at the Didube bus terminal, but I was invigorated by the views as we climbed toward the Jvari pass on the well travelled road to Kazbegi (Stepantsminda), a few hours north of Tbilisi. Nearing Jvari pass I stood up from the back of the Marshrutka (minibus) and asked to be let out at the high point before the road descended to Kazbegi. I crossed the boggy open pass and climbed the tussock slopes. There were small cumulus forming along with several lenticular clouds indicating the southeast winds. My hill faced the right direction and thermic gusts were coming up the slope, along with crosswind from the south. I suspected the winds might be too strong and I’d settle for a quick cross-downwind sled ride into Kazbegi. Launching there were some disconcerting moments where I was rapidly sinking towards the point of no return, where the grassy slopes meet a sheer drop to the gorge below. But I soon connected with a climb from these cliffs. It took me up high for a good look at my surroundings, and with some relief I noted that while there was a considerable SE wind it was easily penetrable. I decided to see how far I could push into the wind, recognising the big mountains southwest of Roshka [Chaukhi massif] in the distance. I made some progress but eventually gave up after a few attempts, both out the front on the spur and higher against the main range. Retreating I found a nice spot to land by a cascading snow melt stream. A breather and I was conscious that I still had some nerves about flying a new area – these are big mountains. I took off and was more relaxed for my next flight, getting smooth lift at the head of the valley before pushing back the way I’d come. I got relatively low passing over the Gudauri ski slopes but connected with a ripper thermal on the corner. Wary of strong turbulence on the edge of the thermal I edged out towards the edge of the big clouds which were forming above me. 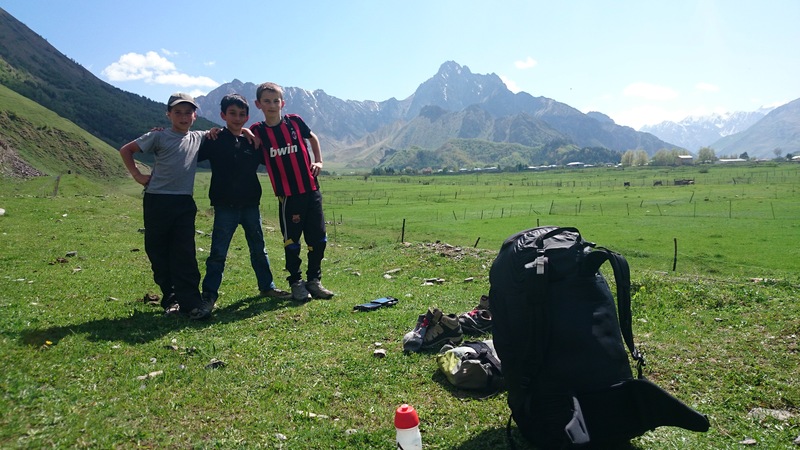 From here I picked a line and sailed down the main valley toward Kazbegi as my face was pelted with snow – more like shards of ice. Cautious of the snow showers I landed on a shelf. A feed, toilet break, and I changed the speed bar rigging on my glider to be directly connected. I used the left over material to make a chest strap, as I’ve sometimes felt the shoulder straps slip especially wearing my extra down jacket. Unfortunately I’d left this behind this trip though and I was definitely feeling the cold while flying. An hour later the big clouds had dissapated somewhat and it was sunny and looking good to fly. I took off for some evening soaring. I spent some time flying the local area, nudging up against the 3000m ridge adjacent. Eventually I decided to pop over a few spurs to the north, keeping my eyes peeled for the meteo station. I only had a vague idea of the position and the altitude but it was nice exploring anyway. A few flecks of snow and noticeable showers upwind prompted a retreat back upwind, which wasn’t overly difficult with the speed bar. With showers falling where I’d just been I was treated to beautiful rainbows. Then I was very surprised to see a bear galloping up the slope beneath me. Having an affinity with wild creatures I decided not to disturb him, crossing the valley to some rugged cliffs beckoning in the evening light. Finally after thermalling up there I crossed back again and found a tussocky spur to camp the night. It was still windy there and in fact it blew all night – luckily my bivouac spot less than one hundred meters away was well sheltered. 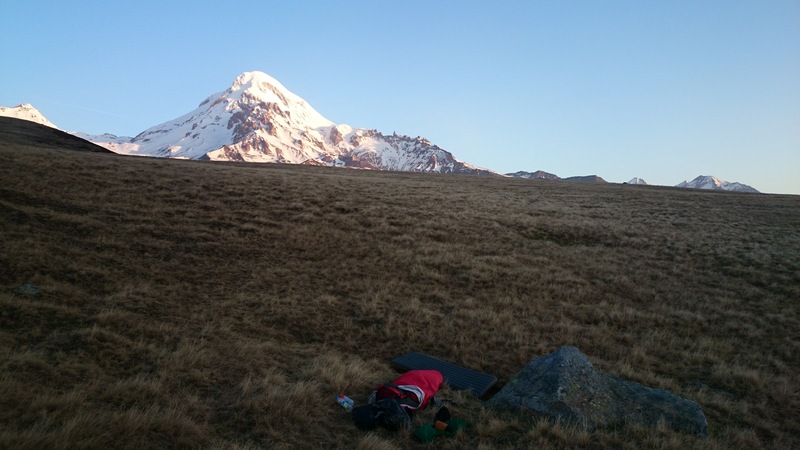 Especially chosen for it’s great views of Mt Kazbek (and phone reception) I knew I’d be in for a cold night. Situated in a good spot at 2600m altitude I woke briefly at 1am with a full moon overhead and thought if only I’d brought the micro spikes I’d have no excuse not to climb Mt Kazbek. My alternative plan was rise with the light at 6am, scrape the frost from on top of my bivouac sac, and depart 15 minutes later, climbing up to Bethlemi hut at about 3650m before the snow got too soft. Here I regretted leaving my Russian phrase book behind – there were a few climbers and skiers about. I lazed in the hot sun, noting the SE’r I’d hoped to finally use to my advantage and soar up Mt Kazbek had died away to nothing. I launched around midday with very light thermal breezes rising up besides the hut. A nice climb over the glacier snout got me back over the height of the hut. I crossed the main valley intending to fly up to Juta and hopefully over the pass but on arrival the SE’r made its presence known yet again. I battled to push in front of a spur but short of landing in the lee and walking up it didn’t seem possible. Retreating to the main valley I landed and ate my leftover food. While the morning seemed stable, big clouds were now building. Deciding to stay the night in Kazbegi I started walking before being picked up by a mother, daughter (speaking english) and two younger kids who did a U-turn to drop me at their guest house before resuming their family outing. I met some German’s and Ukrainians that night and it was interesting to note they were mostly engineers (aerospace and electronics too!). Next morning when I woke at 8am there was still a down valley flow – perhaps the katabatic substitutes for the daily SE flow. I’m keen to chat to a forecaster in Tbilisi when he passes through – and he thinks he’s on holidays! I climbed up to the popular Sameba church, which presents some great photographic opportunities. Flying wouldn’t have been pretty though so I continued back up around to near where I’d previously bivouac’d to launch. I took my time for lunch. The cycles were quite strong so I expected a rough flight. I was partly waiting for the sun to come around, hoping to fly the SW faces over Kazbegi and check out the waterfalls from above. But it was not to be – after soaring a spur in cross down valley flow I suddenly decked it. The timing was convenient though for an afternoon Marshrutka ride back to Tbilisi, and I flagged one down within minutes of reaching the road. There is some big air in this valley but it is a beautiful place and I definitely want to come back – I’m dreaming of it as a vol biv destination from the Azerbaijan border and am wondering if it’s possible to reach it on a good day from Tbilisi. This entry was posted in Uncategorized and tagged adventure, flying, paragliding, parapente, share my joys, vol biv. Bookmark the permalink. congrats, sounds like a fantastic flying experience. 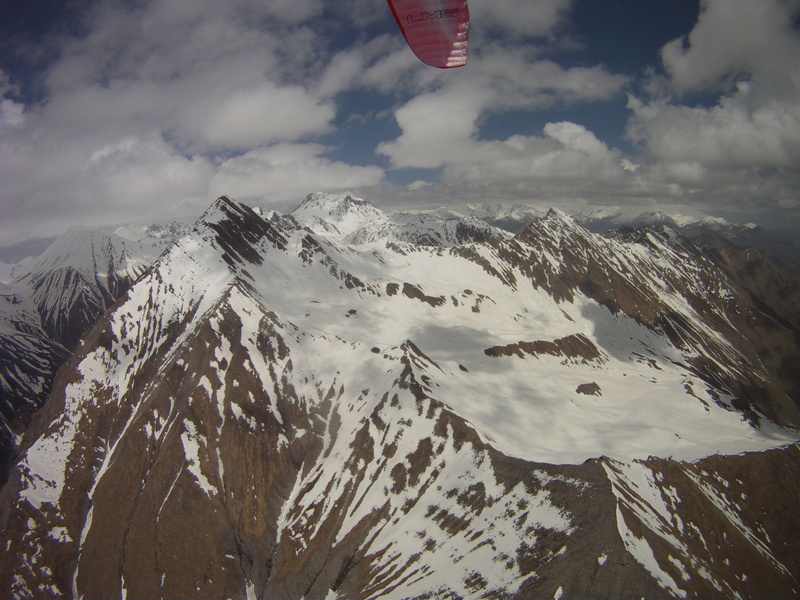 I flew around Mt Kazbeg in September 2006, and we also found the winds higher up to be very strong, hard to work against. 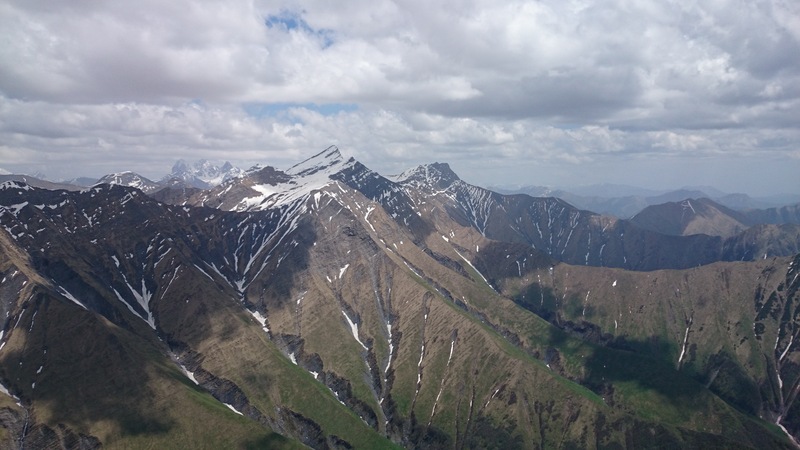 Roland G., a great pilot, flew to the other side of the valley of Stepansminda/Kazbegi, and soared up the entire range from just above the village to above the peak, essentially the Russian border. Some stunning photos, especially the evening soaring. Nick, yes, that range is to the east of Kazbeg. This morning another paragliding friend and I just watched your great Kazbeg YouTube video again. Great stuff! If you head to West Georgia, let me know. There is also a kiwifruit plantation that you may find fun to visit. I am unlikely to be able to join you, alas, but still, let me know if you head through Zugdidi and want a place to stay, and see a kiwifarm. I may be around there when you head back. safe travels, and your Mestia films look great. It’s a great place to fly, and indeed big big mountains!